The George Washington University Board of Trustees on Friday heard updates on the student experience and remarks from incoming Student Association President Ashley Le. The board—together just days before Commencement in its last full meeting of the 2018-19 academic year—also approved the university’s fiscal 2019 budget and policies on prohibited relationships and sexual harassment and violence. In remarks, rising senior Ms. Le addressed the board as incoming president of the Student Association. Ms. Le emphasized that her administration would focus on enhancing student support and resources from their first day on campus to graduation, addressing issues such as affordability, food insecurity and a feeling of community. Outgoing SA President Peak Sen Chua introduced Ms. Le and outlined his administration’s achievements during the past year. 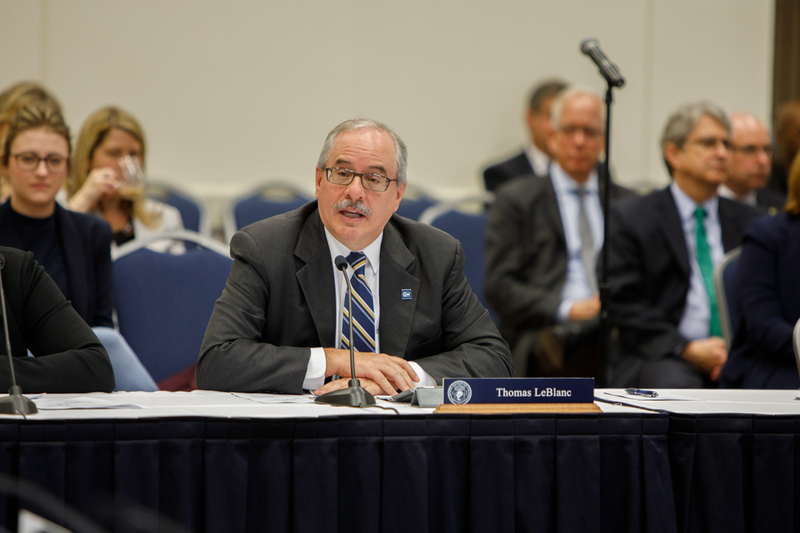 In President Thomas LeBlanc’s remarks to the board, he highlighted the university’s efforts to improve the student experience, including a new dining plan, planning for a new residence hall and renovation of Thurston Hall and the new Enrollment and the Student Experience organization. A website now charts the university’s goals and progress in improving the student experience as well as GW’s four other strategic initiatives, he said. Reflecting on his first year, Dr. LeBlanc said he has spent his time getting to know the “people, places and programs” at the university. In particular, he said, he has enjoyed student and alumni events and interacting with faculty and staff. Dr. LeBlanc said he is going to be a “cheerleader” for GW, and he will reinforce his laudatory comments with the facts and figures GW has to celebrate and support them. All board committees and task forces, including the Student Experience Task Force, also provided reports during the regular session. Providing the update for the Student Experience Task Force, Chair Ave Tucker, B.B.A. ’77, said the group is finalizing a report of findings from its listening sessions with students, faculty and staff. The report will include six guiding principles and emerging goals for the student experience, addressing: community, academics, safety and well-being, financials, service and facilities. The report, which will help inform progress in improving the student experience, will be posted on the student experience strategic initiative website when finalized. “They will help guide change for the future,” Mr. Tucker said. Also Friday, Board Chair Nelson Carbonell Jr., B.S. 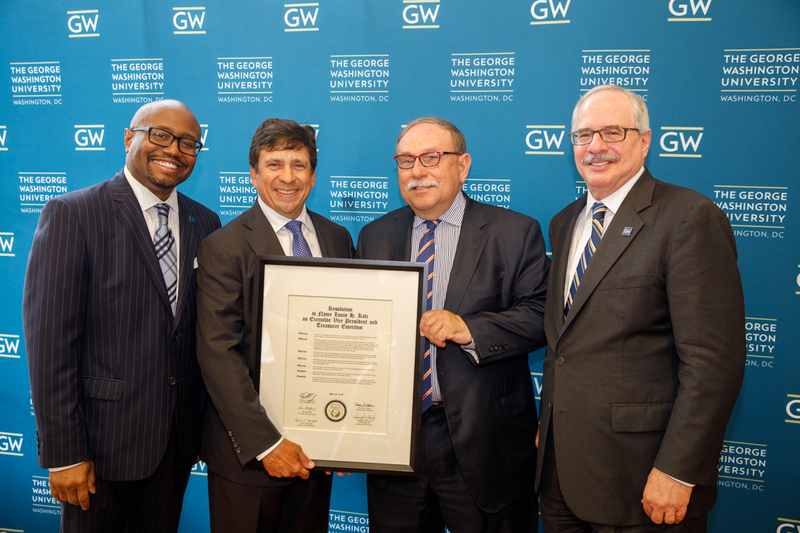 ’85, presented a resolution recognizing Lou Katz, who is retiring as executive vice president and treasurer, noting his involvement in transformational university projects and buildings as well as his keen oversight of the university’s financial strategy. Mr. Katz was unanimously named executive vice president and treasurer emeritus. “Lou was always someone you could rely on for advice, for friendship, and for, ultimately, wisdom,” Mr. Carbonell said. Earlier in his remarks, Dr. LeBlanc called Mr. Katz a GW “institution” and thanked him for staying engaged with the university. Sylvia Marotta-Walters, chair of the Faculty Senate Executive Committee, told the board that faculty members look forward to continuing to monitor and review the policies, approved later in the meeting, on prohibited relationships and sexual harassment and violence. Venessa Marie Perry, M.P.H. '99, president of the GW Alumni Association, told the board that the association continues to work collaboratively with the Office of Alumni Relations with the goal of raising its profile as the university’s chief volunteer organization engaging alumni in volunteering and philanthropy. The board approved a resolution thanking Paul Duff, professor of religion, and Cheryl Beil, associate provost for academic planning and assessment, co-chairs of the self-study steering committee of the Middle States reaccreditation process. The university received positive oral and written reports from Middle States and is awaiting its final decision. Dr. LeBlanc also thanked Drs. Duff and Beil. The board approved two new Ph.D. programs: one in nursing and another in speech-language-hearing sciences, in the School of Nursing and Columbian College of Arts and Sciences, respectively. Lorraine Voles, vice president for external relations, updated the board on Sunday’s Commencement ceremony and other celebratory events. The board elected four new trustees, re-elected current trustees Ellen Zane, B.A. '73, and George W. Wellde Jr., M.B.A. ‘76, and approved the election of Ms. Zane as vice chair and Grace Speights, J.D. '82, as secretary of the board. The chair also recognized trustees concluding service on the board. Outgoing trustees, who complete their terms on June 30, include: Kyle Farmbry, B.A. ’92, M.P.A. ’94, Ph.D, ’99; James Humphreys, J.D. ’78; David Karlgaard, DSC ’74; Stuart Kassan, M.D. ’72; Jay Katzen, B.A. ’67, M.D., ’72; J. Richard Knop, J.D. ’69; Peter Kovler; Sally Nuamah, B.A. ’11; Steven Ross, B.B.A. ’81; Robert Tanenbaum, J.D. ’82; and Cynthia Steele Vance, B.A. ’79. They were recognized for their service Friday. The Sexual and Gender-Based Harassment and Interpersonal Violence Policy and related policy on prohibited relationships were approved by the GW Board of Trustees. Four new trustees will join the board starting July 1.